One of the unforeseen negatives of the Affordable Care Act was increased costs for workers’ compensation insurance, coming both from higher taxes assessed to insurance companies and higher costs of claims. The claims costs are on the rise due to more dependance on workers’ comp vs. traditional health insurance, increased medical costs and the big one, increased legal fees. As the costs rise, the profit margins diminish. Naturally, the carriers are seeking to reduce their risks to maintain acceptable profit margins. This has led to a “hard market” where risks that were previously accepted are now being cancelled or non-renewed. 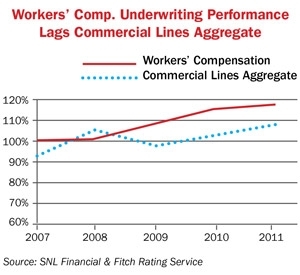 It is important to any employer who depends on having reliable workers’ comp insurance to remain off the radar of the carriers and their underwriters. The squeaky wheel get’s the grease, or on this case, the cancellation. 1: Do not shop your workers’ comp policy right now. This will only draw attention to you or your company. Many lesser experienced agents use software that “shotguns” your application to several carriers, and several intermediaries who may duplicate your submission. Nothing sends a red flag to an underwriter more than seeing a submission come in from multiple sources at the same time. 2: Don’t do anything to jeopardize your policy. Don’t hide information, improperly describe working conditions or in any other way try to deceive your agent or your carrier. This is not the time to try to get them to change you to a lower priced code. 3: Do everything you can to minimize claims. Institute a safety program, and if you already have one, make sure everyone is following it. 4: Make sure your website does not advertise you doing “high risk” activities. We’ve seen landscaping company websites showing workers on the roofs of houses, cleaning out gutters. That is NOT in the landscaping comp code description. If you would like more information please use the contact form below. PrevWhy a Professional HR Partner?